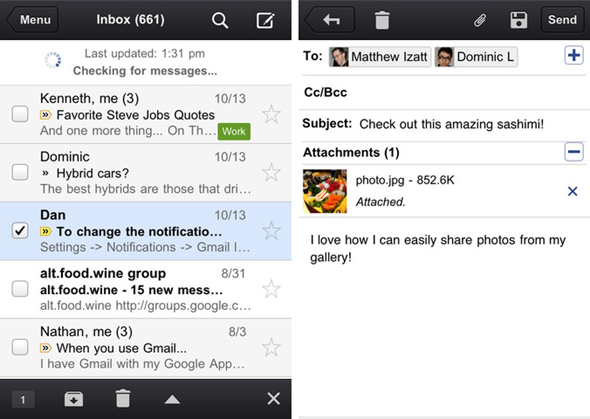 Gmail App For iPhone, iPod touch And iPad Now Available In App Store – Download Now! As we reported, just yesterday, Gmail for iPhone was due to be released in the next few days, well people, that day has come. All raise your glasses and celebrate the release of the native Gmail app for the iPhone, iPad and iPod touch. 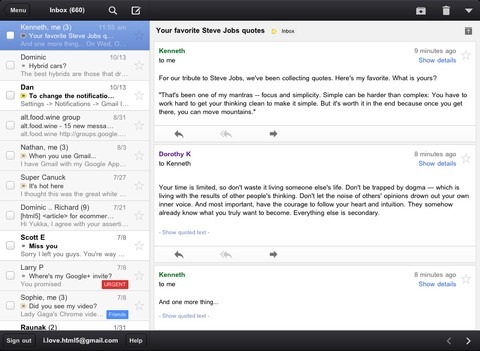 So, what does this official Gmail app brings to your iOS device that the native Mail app doesn’t already have? Well, here are a few features you may have been after for a while; it seems Google has put a lot of their web based experience into this app, and I am very excited, as their web mail experience is about as crisp as it gets. I hope they haven’t released another buggy app like the Google+ app was, I certainly don’t want to update my new Gmail app within hours of its release. On iPad you can navigate mail with split mode. With the new Gmail app, you can organize your mail efficiently and you don’t have to search and search through your mail constantly looking for that important mail, or a photo from a loved one. You have a complete inbox set aside for all the important people, or in fact your work mates with "Priority mail". You can organize your mail by archiving, labeling, starring, deleting and reporting spam (which for me is a massive plus). The app has been optimized so you can perform the simplest tasks with very user-friendly gestures, you can pull to refresh your inbox or whatever folder you want to refresh, or you can swipe through to view your labels without having to even leave the inbox, or slide through each email seamlessly viewing one by one at a time. It’s clear, Google has put a lot of thought into their new Gmail app, and I for one am currently downloading it and will be setting up my mail as soon as I am done writing this. 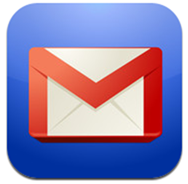 If you want to get you hands on the Gmail app, we have embedded the download link below. Will you guys be downloading this? If so do you think it will replace the native App for you? Please leave any comments as usual on our Facebook fan page.